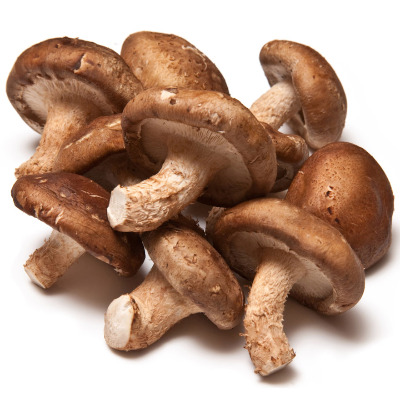 Shiitake Mushrooms have a strong flavor and are a great addition to any dish or sauted in butter and eaten alone . The Jumbo shiitake are hand selected and are These Shiitake can be easily grilled or stuffed with your favorite filling. An 8oz container will have between 4 and 6 Jumbo Shiitake. Our mushrooms are grown indoors so there is no need for pesticides or chemicals. We use a 100% organic process during the growing of all our mushrooms. Your order will only include the edible parts. No stem or spines.Shiitake Mushrooms have a strong flavor and are a great addition to any dish or sauted in butter and eaten alone . The Jumbo shiitake are hand selected and are at least 3 inches in diameter. If you look close at the picture you can see a quarter sitting on the top of one of the shiitakes. These Shiitake can be easily grilled or stuffed with your favorite filling. An 8oz container will have between 4 and 6 Jumbo Shiitake. Our mushrooms are grown indoors so there is no need for pesticides or chemicals. We use a 100% organic process during the growing of all our mushrooms. Your order will only include the edible parts. No stem or spines.